I was contacted recently by Natalie from the UK based mental health charity; The Shaw Mind Foundation, to help promote their campaign for greater mental health training in UK schools. Please sign the Shaw Mind F﻿﻿﻿﻿﻿﻿﻿oundation's petition and make this ﻿﻿﻿happen﻿﻿﻿! I would like to share this UK government petition on behalf of mental health charity The Shaw Mind Foundation. As you probably know children with autism can also develop mental disorders such as anxiety disorders, attention deficit hyperactivity disorder (ADHD) or depression. Research shows that children with ASD are at higher risk for some mental disorders than children without autism. Please sign and share this UK government petition to get mental health education as a mandatory, core national curriculum subject within UK primary and secondary schools. 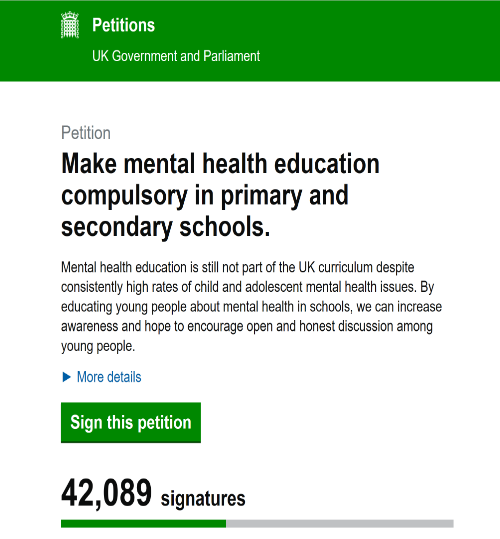 Please sign and share this UK government petition to get mental health education as a mandatory, core national curriculum subject within UK primary and secondary schools. Most of us that are on the autistic spectrum, children and adults, are highly likely to suffer from anxiety and depression. The symptoms of poor mental health are easily dismissed as "just another aspect of ASD." Of course, autism is not a mental health condition in itself. It is a developmental condition and cannot be "treated" with medication or talking therapy, but it can be managed with strategies to cope with the sensory, organizational and social communication difficulties that overwhelm us on a daily basis. However, it's important to realize that poor mental health in children and adults with autism can be treated, but this must be done by mental health professionals that also have a good understanding of autism. For children with or without autism, education in all aspects of mental health and emotional wellbeing, would be a great benefit to the individual and society as a whole. It would enable young people to become more aware of how to look after themselves at stressful times, for example: Coping with bullying and exam pressure. PLEASE SIGN AND SHARE, SHARE, SHARE!!! Hi Steve, my daughter is 23 and has Autism. She sadly was in a mental health crisis 18 mos ago and spent a year in an acute mental hospital because there were no appropriate rehab facilities to help her have coping skills. I developed a website to help other families to navigate mental health http://www.autisticadultsincrisis.com. I believe we have to campaign at a national level to challenge policies around the welfare and rights of young adults with autism. I’ve just seen your message from December. I would be interested in highlighting your story on my website – if you are ok with this?